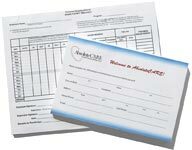 PFL can help you create a notepad of any size and shape and in whatever sheet quantity. We have custom die-cut available that are real attention-getters! Pages per pad range from 25 to 100 or more, and are glued with chipboard backing. Some customers add distinctive details such as rounded corners or side printing. Our uncoated 70# stock is very popular because of its writing ease, but many options are available. Basically, if you can dream it, we can print it! What are the standard sizes of notepads? 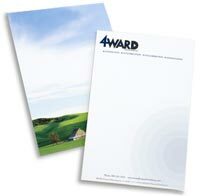 The most popular standard size notepad is 5.5 x 8.5 inches, followed by 4.25 x 5.5 inches, then 8.5 x 11 inches. Can I get custom size notepads? Sure, we can produce almost any size or shape notepad you want. What kind of papers are used with notepads? We have a variety of standard papers listed below that are selectable on the ordering page, but any custom, recycled, premium or specialty paper can also be used. Just ask for a price quote. How many sheets of paper are commonly in a notepad? 25, 50 or 100 sheets are most popular, but we can make them any count you need. Different paper stocks have varying thicknesses, so you should decide on a thickness and then we can figure out the number of sheets that will equal that thickness, either with or without a chipboard backing. Can I use a backing sheet other than chipboard? Sure, we can use whatever you want for the backing material, including a sheet with printing on it. You can also have a custom cover as the top sheet of the pad. What color is the glue that you use for padding? We use clear glue on our pads. Can I have the padding on the side instead of on the top of the sheets? Yes, the padding can be on any side of the sheet that you prefer. What custom printing options are available on notepads? Round corners, drilled holes, foil stamping, Pantone color inks, perforations, and custom die cut shapes are just a few popular options that turn notepads into a memorable reminder of your brand, like a tiny billboard right on a customer or prospect's desk. Can my image bleed off the edge of the notepad? Yes, it can bleed off any or all sides. Please include a 1/8" bleed in your graphic design file. Do you have notepad templates to help me design my notepad correctly? 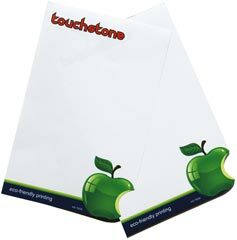 We have templates for our standard notepad sizes; contact us for custom sizes and shapes. Can you help me design a notepad for my business? Yes, we have experienced designers that will work one-on-one with you to create a great notepad that meets your branding, marketing or use case needs. Don't have a notepad designed and ready to print? You've got options! When you want to have something to keep your brand in front of your prospects, consider a custom notepad design with help from our expert design team.